Global 1000 Support Manasseh Ministry National Giving Day May 1, 2019! Donate! The Family, Faith & Finance initiative is an opportunity to not only increase awareness to the need of Financial Literacy within the Urban Communities, but also a way to get to the unbanked and under banked population that needs a “second chance” in banking. Our goal is to draw families and the community together for the teachings of financial literacy by partnering with some of the most influential people and institutions that share the same goals in helping and creating a much needed community initiative. With so many consumers who lack the basic understanding of banking and the financial system, this vehicle will help educate the masses and give direction on other possible options available. This will provide implementation of processes that will help our congregations and communities thrive by promoting fiscal responsibility through a comprehensive action plan focused on teaching Financial Literacy. 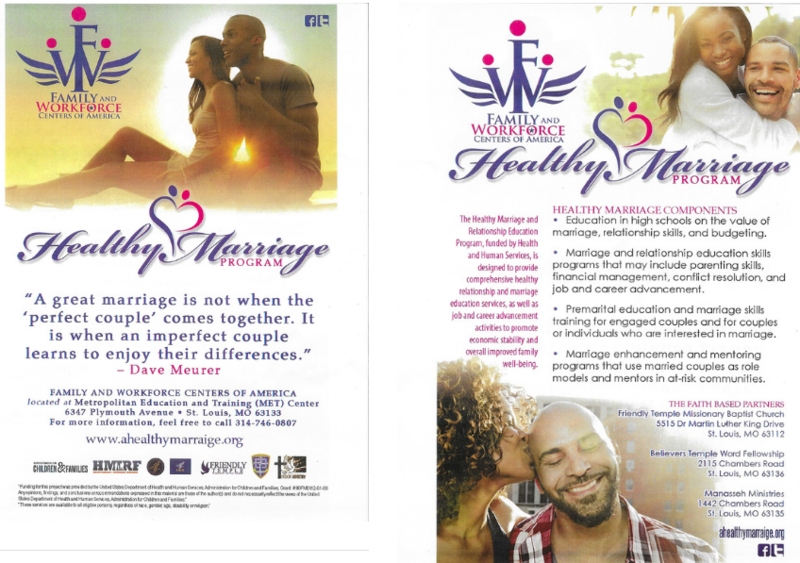 Promotes healthy relationships for Couples, Singles, and Married Couples. Theme: The Best is Yet...………………………. EXMAD stands for EX-offenders Making A Difference in the communities of which they live. EXMAD is a fund raiser for children whose parents are incarcerated. We seek to give 20 scholarships to children this year. This year, for the EXMAD event, Manasseh has sought for the pass 6 years to invite Steve Madden, so this year Steve Madden will be honored.. We are the first ex-offender agency, in Missouri to give scholarships to children in elementary schools, which began is 2007. Manasseh is concerned about the success of today's youth. Manasseh really needs your support as we seek to share with 85 business/churches/ organizations who will support this endowment scholarship fund. We need 60 tables of ex-offenders which only cost $480 per table. There are many wanting to attend EXMAD but lack funds and your support can assure them, they can attend. Manasseh is a 501 (c)(3) tax exempt agency in good standing with both the IRS and the State. Tickets are $100 per person and tables are $800 for a setting of 8. There will be a live jazz band, good food, ex-offenders honored, scholarship to youth, great speaker and as always the Mary B. Williams award to someone caring more about others than themselves. You will have great time and be out by 9:30 pm. For more details about ads please email your concerns to: audimanasseh@gmail.com so that information can be email to you. Look forward to seeing you there. Thank you ever so much for visiting our web site and God bless you ever so much. Pass the word: EXMAD is looking for 300-400 returning citizen and their families to participate.